Set sail on a Canada and New England cruise this fall. The coastal views will surely take your breath away! Canada and New England offer a diversity of incredible cruise vacation experiences, from bustling city escapes and glacier explorations to spectacular fall journeys. Take advantage of a wealth of sightseeing opportunities, uncover fascinating cultures, discover rich history and witness the true majesty of nature as you gaze upon some of the most striking landscapes on Earth. Cruise to Canada for the opportunity to witness at the majestic Niagara Falls, experience the rhythm and blues of the iconic Montreal Jazz Festival, marvel at the magnificence of fall in Halifax or tour charming, French-speaking Quebec – ooh la la! New England boasts a wealth of bucket list-worthy sightseeing, such as New York City’s iconic Empire State Building and sprawling Central Park, Boston’s historic Freedom Trail and the exclusive Martha’s Vineyard. Cruise to Canada and New England from a variety of ports including New York, New Jersey and Boston in the US plus Montreal and Québec in Canada. Halifax is the bustling capital of Nova Scotia on Canada’s eastern Atlantic coast. Despite its sprawling size, the vibrant metropolis maintains a quaint, small-town feeling due to its plethora of significant historic sights, important landmarks, and eclectic districts being easily accessible by foot. The city is renowned for its buzzing culture scene, modern art galleries, and craft-brew culture. Founded in 1630, Boston is one of the oldest and intriguing cities in the United States. ‘The Athens of America’, ‘The Cradle of Liberty’, ‘Beantown’ are just a few nicknames the iconic metropolis acquired from its heavy influence on national culture and identity. In addition to its fascinating history, Boston is also incredibly charming, with both striking architecture and an abundance of natural beauty. Bar Harbor is a quintessential coastal town from Maine located on Mount Desert Island. Home to one of America’s top-ranked national parks, the Acadia National Park stretches over 49,000 acres of land and offers numerous scenic hiking paths for every experience level. Bar Harbor’s downtown is filled with charming gift shops, heavenly sea-to-table restaurants and a handful of intricate museums showcasing the history, culture and natural heritage of the island. Québec City is the oldest French-speaking community in North America. The province capital’s old town is listed in UNESCO World Heritage Sites and teems with European flair, featuring a plethora of well-preserved ancient landmarks, colonial architecture and the only walled city north of Mexico. More than just history, Québec’s spectacular outdoors offers gigantic 98-ft waterfalls, splendid glacial valleys and unique wildlife reserves. Portland, situated in the heart of Casco Bay, is Maine’s largest city. The city lures visitors with its historic Old Port district, characterized by charming cobblestoned streets and 19th century red brick façades teeming with boutiques, art galleries and cute cafes. The up-and-coming cruise destination is popular for its abundance of natural beauty, buzzing cultural scene and fantastic gastronomy, with which a plethora of incredible award-winning restaurants rank Portland in America’s top foodie cities. The birthplace of Canada and the capital of Prince Edward Island, Charlottetown is a historic town named after Queen Charlotte of England. Due to its location in the Appalachian Mountains region, visitors will enjoy a nature filled with rolling hills, dense forests, and rich red soil. Lobster, oysters, mussels, and scallops are some of the delicacies available fresh from the sea to your table. Montreal, the second largest city in Canada, is situated in the French-speaking province of Québec. The historic city was once occupied by the Iroquois 8,000 years ago, however only became an official Canadian city in 1832. A curious mix of old and new, exploring Montreal is like traveling through time, where old cobblestoned alleyways and 18th-century facades mingle effortlessly with cutting-edge architecture and a vibrant ambiance. Situated in the Bay of Fundy, Saint John is the largest city in Canada’s New Brunswick region. Although its industrial façade may deceive you at first, you will soon realize Saint John’s gems are hidden inside the city, where impressive historic landmarks and beautiful Victorian architecture awaits your discovery. The city is also minutes away from the wonderland of nature and wildlife. Newport, arguably the sailing capital of the world, is situated in the New England state of Rhode Island. Newport town is littered with spectacular Gilded Age mansions, historic museums, and pre-revolution buildings. The town’s impressive harbor, once serving as a shipbuilding area, today hosts hundreds of luxurious yachts. Saguenay is situated in Canada’s picturesque Quebec Province. The town is best-known as the gateway to the magnificent Saguenay Fjord, renowned as one of the largest in the world and the only inhabited fjord in North America. A fantastic diversity of natural attractions awaits your visit to Saguenay, in addition to a plethora of historical landmarks that reveal the fascinating cultural roots of this Quebec community. Provincetown is a New England town located at the extreme tip of Cape Cod in Barnstable County, Massachusetts, in the United States. A small coastal resort town with a year-round population of just under 3,000, Provincetown has a summer population of as high as 60,000. Often called "P-town", the town is known for its beaches, harbour, artists and tourist industry. Morehead City is a small city located in the American state of North Carolina and is part of the so-called Crystal Coast which includes many stunning beaches. Rockland, also known as the lobster capital of the world, is a port town on Maine’s Atlantic coast. Downtown Rockland boasts historic architecture dating back to the 18th century and several renowned museums, such as the Farnsworth Art Museum and the Wyeth Center. Beaufort is the second oldest city in South Carolina, and is known for its scenic location and historical charm. The city is located on Port Royal Island, one of the coastal Sea islands of South Carolina. Visit stunning and cosmopolitan cities like Vancouver, Quebec and Montreal. Enjoy the world’s second-largest country, the astonishing diversity of landscapes; glacier-topped mountains, deep coniferous forests, emerald lakes and unspoiled coastlines. When you are planning your cruise to Canada, consider the many reasons why this amazing country will leave you speechless. There is something for everyone to enjoy in Canada, which is why the country is so popular with families and solo travelers. With so many reasons to choose Canada, all you have to do is figure out which cruise to take and what to see first. New England cruises offer sophisticated and eye-catching ports of call, stunning national parks, and rich history. Take in the sights of the Atlantic Ocean coast and cities like Newport and Boston. As you make a port visit, enjoy beautiful lighthouses and meals of fresh New England lobster and crayfishes. 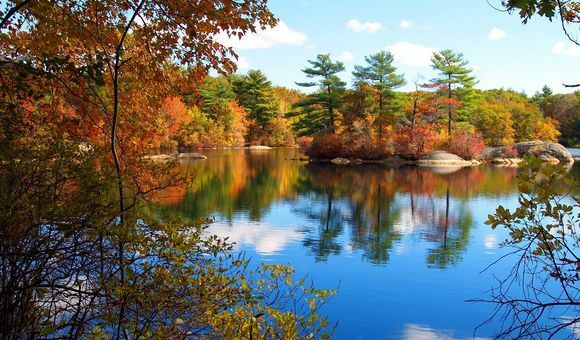 New England cruises in autumn guarantee spectacular and colorful scenery, brilliant autumn colors and breath-taking coastal ports. Many of the country’s most popular attractions, such as its national parks and spectacular mountain glaciers can be reached right around Vancouver. There are many reasons to love western Canada, a country full of rich cultures, wildlife, and unforgettable landscapes. Sail along wild coast and take in unrivaled views of the glaciers, islands, and villages. An Alaska cruise is a fantastic option available for those looking to combine an Alaska cruise from Seattle with Western Canada experience and explore Northwest Pacific even more. Explore the many charms of the Canadian province of Quebec. As a birthplace of New France Quebec is naturally stunning and rich in French culture. From the vibrant cities to the beautiful scenery, this Canadian province charms its visitors with 17th- and 18th-century buildings. The region is being served by many conveniently situated ports that offer a winning combination of main Quebec attractions, such as Montmorency Falls, Notre-Dame Basilica, plus art exhibits, events, and concerts. Now is the best time to search our best cruise deals and visit Canada and New England. Book online or call our experts at 1-888-403-1425. If you have a short time until you travel, then browse through our last minute cruises or our cheap cruises option.